Which Korean restaurant in Paris to taste? Speaking of Korean food, there must be bibimbap, kimchi, budae jjigae, Korean barbecue, spicy fried rice cake… No matter whether you have the nostalgia for Korean cuisine, or if you want to offer an exotic flavor to your taste buds, you can definitely find some fantastic Korean restaurants in Paris. This light-filled restaurant is situated nearby the Avenue des Champs-Élysées. The interior decoration is simple and elegant with pretty color combination. Although it is a little bit small, this can be a sweet place to have a meal with friends and family. They provide various dishes, such as japchae, bibimbap, barbecue etc. If you are looking for a restaurant with a good value for the money after shopping in the Avenue des Champs-Élysées, why don’t you give the restaurant Soon a shot? Recently opened, this new Korean restaurant has already won a soaring popularity. Hwarang is located at the junction of the 5th and 13th district. As the owners, a Korean couple, promised, they use only fresh ingredients. The environment is very sweet, just like at home. In this restaurant, you can take main Korean cuisine and barbecue, of course, the taste is authentic. Moreover, the price is also very reasonable. The first time I heard about Dokkebi, it was from a Korean friend who came to Paris for her study. Indeed, the place is small, there are just a couple of times downstairs and upstairs. However, everything tastes exactly as in the Korea. With a lot of choices and reasonable prices, you can come here with your friends to relive the tastes of dishes made by mom. Located in a corner of the street, Jeongane is small but definitely a good and sweet Korean restaurant in Paris. There is no denying that the service is very comfortable and fast. If you order the barbecue, you will find that the meat is already macerated, which gives it a particularly succulent taste. This is a Korean restaurant full of modern art, both in restaurant decoration and food presentation. BBQ, grilled pork dumplings with secret recipe, traditional bibimbap and other classic Korean food… Basically you can find everything about Korean cuisine. The ambiance is comfortable not only for a small meal between friends, but also for groups. If you decide to organize a group meal, it’d be better to book tables in advance. Tasty food, elegant decoration, friendly service… What can we expect more for a restaurant? Shingané is situated near Cimetière du Père-Lachaise. After a stroll in the Cimetière, perhaps you will enjoy another nice moment in this restaurant. Although it is larger than most of Korean restaurants in Paris, I suggest you make a reservation just in case. Sodam is a Korean restaurant near Montparnasse Tower. A good choice after enjoying the wonderful city view on the Montparnasse Tower or hanging out in the quarter. As an authentic restaurant, it is highly recommended by one of the most famous French food comments website, Lafourchette. Barbecue, fried dumplings, bibimbap… whatever you are looking for, you can find it here. It is said that the owners of Sodam is twin sisters from the Korea, therefore you can taste real Korean food with family recipes just like in the hometown! This restaurent of some repute in Paris is particularly famous for its barbecue. Accompanied by the aroma of grilled porc, their kimchi cake, fried vegetables are also worth trying! I bet you will step in this restaurant with plenty of expectations and go home with full of happiness. In consideration of its good business, I suggest you make a reservation first before going. A charming city view on the Eiffel Tower, a cocktail in your hand and a loved one by your side, who would not be pleased? Rooftops are the ideal place to take a rest during your holidays. But you’re sure where to go? ParisByM will help you to choose a rooftop in Paris, to see the city of light in all its glory! 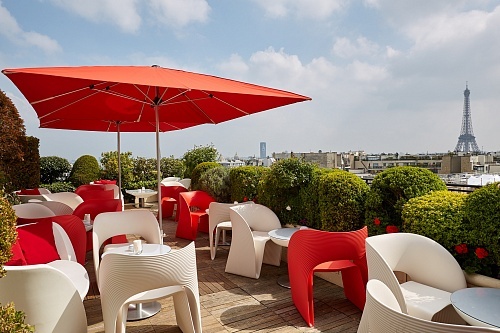 During your shopping session, take a break on the Galeries Lafayette’s rooftop and rest on one of the comfy chairs located on the 7th floor of La Coupole. 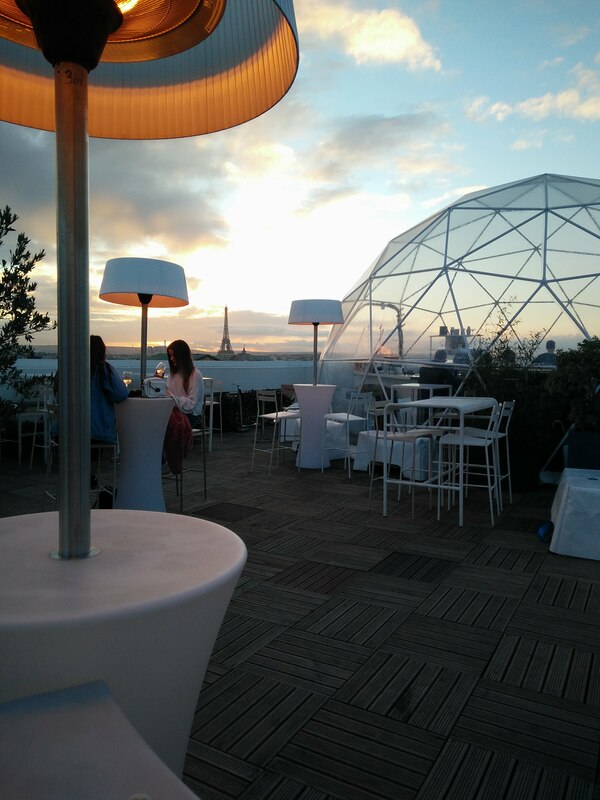 You will be able to appreciate a great view over Paris from this rooftop, while enjoying a drink in the Cube Bar. 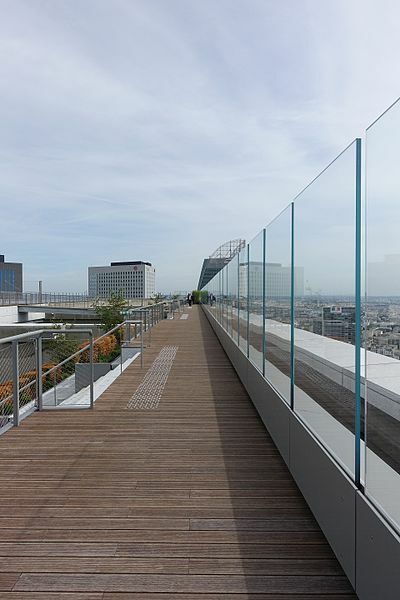 Visit the rooftop of Paris’ highest skyscraper, the Montparnasse Tour: a dynamic place where many activities happen, like meditation classes or trampoline sessions. With a view of 360° from a height of 210 meters, it is surely one of the most breathtaking views from a rooftop in Paris. You will be able to see all the most famous monuments of the capital. In the business district of Paris, La Défense, the rooftop of the Grande Arche offers you 1 000m2 of open air areas with a garden. Admire all the Parisians monuments while walking along the promenade deck. Different activities are offered, like an outdoors cinema or an ice-skating ring in winter. In addition, photo-journalism exhibitions are often displayed. Chill at Le Perchoir Marais: drink cocktails and eat tapas at the hottest rooftop in Paris. Located in the Marais district, it is “the place to be” for Parisians and tourists alike. Transformed during winter in a cosy and warm style, you can enjoy a drink throughout the year. Take a rest on the top of the Holiday Inn hotel : on the menu, delicatessen, wine and cocktails. Surrounded by palm trees and nature, discover Notre Dame de Paris cathedrale and the city from a different perspective. The idyllic setting will take you to cloud 9! If you want a calm and casual place, far from touristic areas, this is the rooftop you need to go to. Simply furnished, you will feel at home, but with the addition of a gorgeous view, French specialities to taste and affordable cocktails as a bonus. Enjoy delicious dishes one of the most charming rooftops in Paris, just around the corner of the Eiffel Tower and the Arc de Triomphe. The enchanting hanging garden in a luxury rooftop, combined with an exceptional service, look totally like heaven! 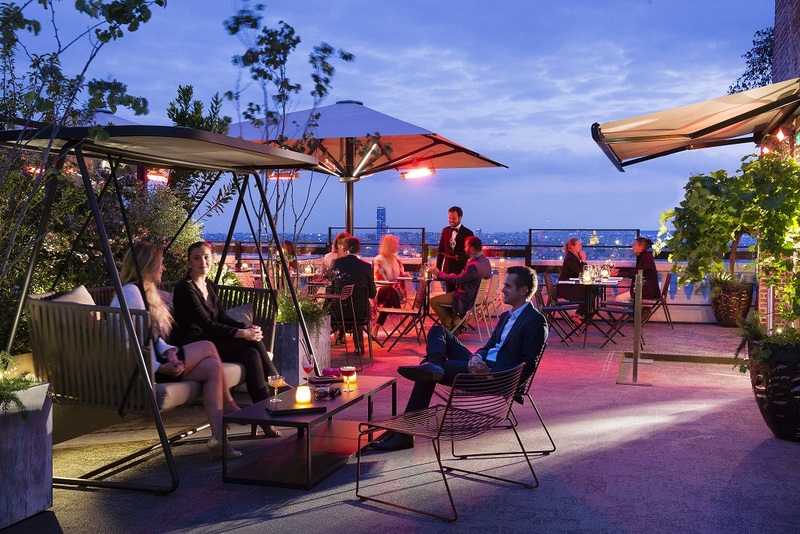 Not a real rooftoop, but located on a hill and therefore overlooking Paris, this elegant place will allow you to eat dishes and drink cocktails in a very French-style decor. The chef mixes French local products and flavors from all over the world, creating incredibly tasting gourmet meals, and this in addition to the stunning view of the Eiffel Tower. From this flowery summer rooftop, you can have a gorgeous view over most of Paris landmarks, including the Eiffel Tower, and over the famous Molitor’s swimming pool, renovated a few years ago only. In this colorful place, you will find a Clarins’ spa and numerous activities. Open from May to September. 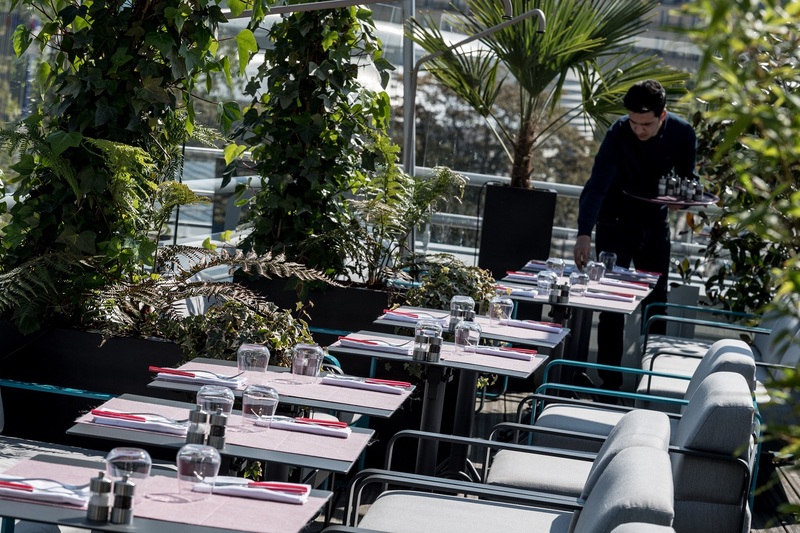 On the 7th level of the Terrass’Hotel, close to the Sacré-Cœur basilica, you will find a restaurant and a bar with large bay windows, and a green terrace with a romantic atmosphere. The view on Paris completes this ideal place to share a sweet moment with your loved one.